Publication: March 1st 2014 by Write for You Publishing. "... a darkly romantic beginning to what promises to be an unusual contemporary YA fantasy series." When Cora’s mother whisks the family away for the summer, Cora must decide between forging her future in the glimmering world of second homes where her parents belong, or getting lost in the bewitching world of the locals and the mystery surrounding a lonely old woman who claims to be a selkie creature—and who probably needs Cora more than anyone else. Through the fantastical tales and anguished stories of the batty Mrs. O’Leary, as well as the company of a particularly gorgeous local boy called Ronan, Cora finds an escape from the reality of planning her life after high school. But will it come at the cost of alienating Cora’s mother, who struggles with her own tragic memories? I nearly jumped out of my skin. I whirled frantically about to find the source of the voice. A tiny old woman sat on the porch of a house a few yards back from the boardwalk. I’d taken no notice of the small yellow house when passing by, as most of the houses this way were just as tumbled down as the red cabins around them. The yellow house was short and squat, the paint faded and chipping around the windows. A round window peeked from above the porch but it was dark and cloudy. Yes, I find you incredibly freaky, I thought. Your little house is creepy and your voice is like bugs crawling on my skin. “No,” I chirped aloud. “The ocean can make one jumpy,” she smiled. One of her wrinkled hands strayed to absently touch the shiny paisley scarf covering her hair. “Do you need directions somewhere?” The hand wandered down her short neck and finally settled back in her lap. “No,” I stammered, “I’m just looking.” Just looking? For what? An early death? “Oh, yes, there is a lot to look at, isn’t there?” The old woman seemed pleased with this. She sat in a huge wooden rocking chair, bobbing slowly but diligently back and forth. It creaked—either the chair or the woman’s old joints—at regular intervals. A matching chair rocked, empty beside her. An effect of the wind rolling off the ocean, no doubt, but a shiver skittered down my spine nonetheless. “The best suns are always after the best storms,” she said. I nodded, though she didn’t look at me. Her dark eyes, after appraising me once, had returned to roving the horizon of the ocean, never stopping to linger over anything in particular. Her hands lay limply in her lap as her feet, in house slippers, kept the chair rocking. My automatic grunt of a response died in my throat. Ash what? “Nothing left but a puddle of water if it’s caught in the sun. They’re nocturnal, you know.” She looked at me this time. “I … uh, yeah …” No, no, I didn’t know, and I sure as hell didn’t want to know. “Water spirits. Of course.” I nodded vaguely because asking what a water spirit was would be counterproductive to my escaping this terrifying conversation. “You’ll help me, won’t you, dear?” she said, without looking at me. “I …” have absolutely no response for this. What on earth could I help her with? I grabbed at the excuse. “Yes, of course, and—and I was just on my way to do that—to go swim—I should be going. Swimming. That way.” I backed away slowly, waiting for her to toss another warning about ashbugs at me, but she was only nodding slowly at the horizon. As if I needed more reasons to be terrified of the water—water ghosts hadn’t even made my preexisting list. Summer in this town was going to be worse than I’d previously assumed. Already 100 percent of the population I’d met was certifiably whacko. I'm the YA author of the USA Today recommended HEARTS OUT OF WATER series and the brand new HUMMINGBIRD SAGA. When I'm not writing, I'm usually freelance editing for awesome clients like Anna Katmore (formerly Piper Shelly) and Month9Books/Swoon Romance! 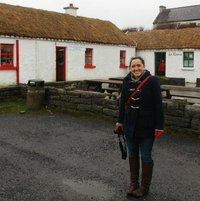 I split my days between my hometown, St. Louis, and my adopted love, Galway, Ireland. Thanks for stopping by!! Good luck! Thanks for having me! What a DARLING blog!! Sweet story of connecting the past with the present and future. Thanks for the giveaway.